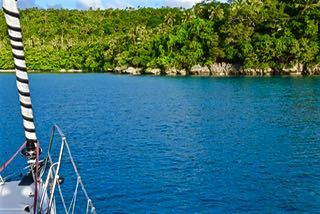 We decided to leave the Bay of Neiafu to explore more of the Archipelago of Vava’u. Morning sight over Into The Blue! 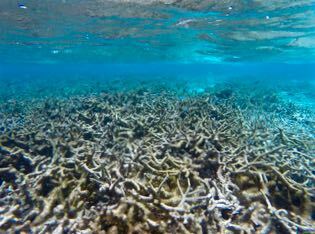 We started to sail South of Neiafu and headed towards the Coral Garden. 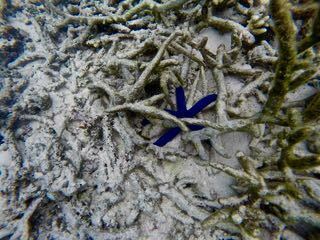 We found a different Coral Garden snorkelling in what we found to be more of a forest of corals and some bright blue sea stars. As the weather gave us pretty strong winds, 25 knots, we decided to make it easy for us and anchor in a bay not too far: Port Maurelle. 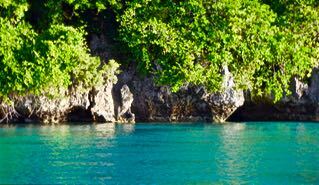 A beautiful bay with lovely clear turquoise water and rocky seaside. 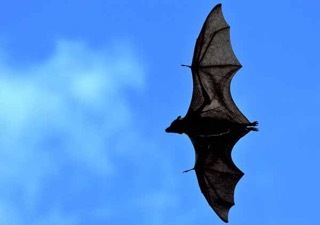 On the contrary to many other bays we had anchored where we discovered the wonderful wildlife under water, Port Maurelle offered more exciting wildlife in the sky: the Fruit Bat also known as the Flying Fox. An interesting sight for breakfast. 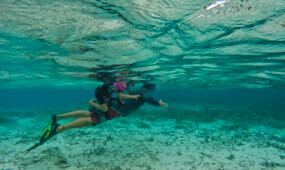 The youngsters on Into The Blue worked hard on their mission. 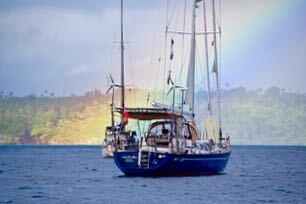 Having a blue hull, the colour needs constantly to be polished. The only way to really make it nice and shiny is to rub it with baby oil! Josh, Tom, Laura, Kathrine and Dearb together looked like a giant spider waving its arms along the hull turing Into The Blue into Shining Blue! 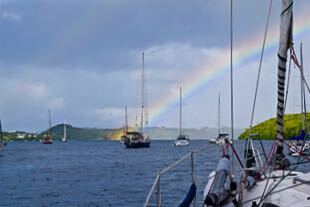 This afternoon we went ashore with Gina from Into The Blue and Mary Beth from Paradise Found. 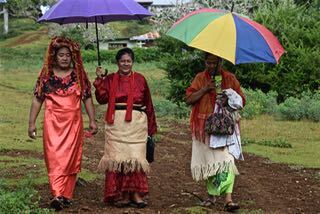 We walked along the path and met Tongans just coming back from the Sunday church ceremony all well dressed for this holy day of the week. 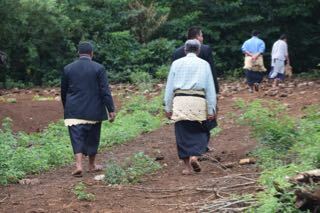 The men are dressed in their suits, the same top as if walking around Wall Street, however the trousers are changed to the Tongan skirt and walking barefoot. The women wear their most beautiful dresses and protect themselves from the sun. 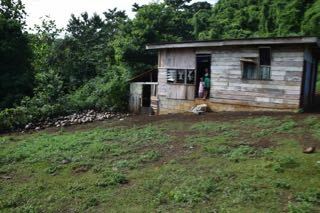 We walked further into the village of Kapa and found this little hut just by the church. By the door stood a woman waving energetically at us so we respectfully and curiously approached the hut. 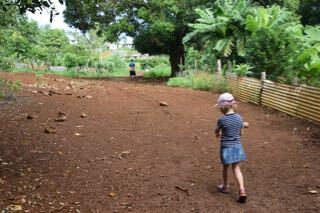 She invited us by laying out a carpet and quickly sweeping the floor. Her English was poor however we managed to communicate. 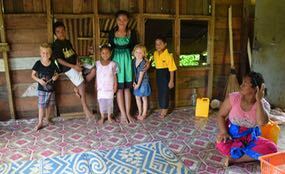 Her hut had two rooms: one for socialising, the other for sleeping. 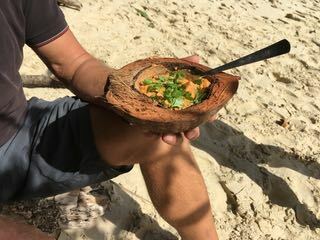 She sat down again and continued her cooking for lunch where she prepared in a bowl raw fish in coconut milk and lime. 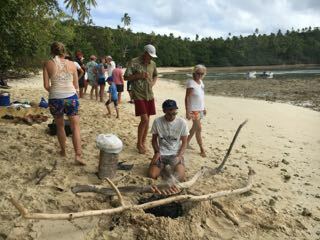 The hut had no kitchen, no stove, no fridge. She told us she had 9 children and was pregnant with her 10th! Her husband is away 6 month / year working in New Zealand. He was to be expected back in July. She was very warm and friendly. For the photo she asked to me to wait as she wanted to fetch the youngest girl’s dress who was forced to put on the uncomfortable and somewhat too small dress in the heat. 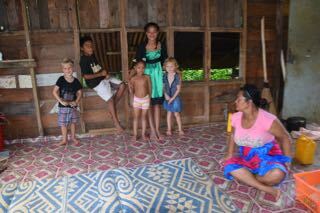 What a lovely moment getting closer to the Tongan daily life, culture and local people. We came back later on with toys, more pencils and paper Alex and Inez learned to give away. 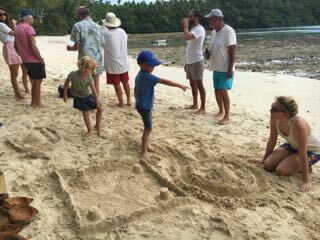 The day after more World ARC boats joined Port Maurelle so we decide to through a BBQ on the beach for lunch: Into The Blue, Alcedo of Rhyme, Blue Summit, Paradise Found, Aliena and another German boat that we invited too. 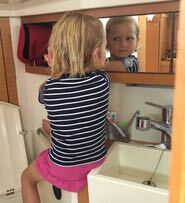 Inez getting dressed for party! 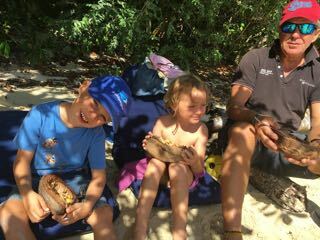 Preparing the BBQ and Dearb building sand castles with Alex and Inez. Missing on plates we had to widen our perspectives. This worked perfectly well! 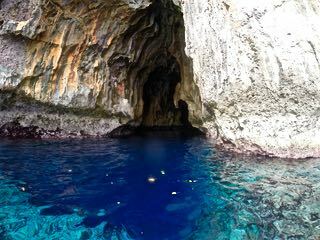 Before leaving Port Maurelle we took the dinghy along the shore and visited Swallow’s Cave. 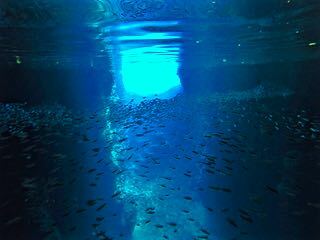 Totally amazing experience: magical and beautiful snorkelling as the sun light (best at 15h00) reaches the cave and lightens up the huge fish shoal and the deep cave underneath.